Powerful tools for decision makers. Collection, analysis, and utilization of critical data for strategic planning. Supporting champions of improved policies and programs. Avenir Health contributes expertise in HIV costing and modeling to the USAID funded Health Policy Plus (HP+). Team members support USG and host country governments in developing and using HIV cost and modeling data for decision making, as well as training for counterparts on these topics. Avenir Health is supported by the Gates Foundation to implement the Track20 Project, which monitor’s the progress of the global FP2020 initiative by building country capacity and producing annual family planning indicator estimates in the world’s 69 poorest countries. Supporting Johns Hopkins’ LiST project, Avenir Health was charged with implementing a computer-based tool designed to estimate the impact of different child and maternal intervention packages and coverage levels. LiST has been used to support research and ministry of health personnel for policy decision in developing countries. Avenir Health's premier analytical tool developed to support policy decisions concerning public health. Spectrum includes modules for examining health intervention impact and costing along with underlying demographics. A model used for supporting costing, budgeting, financing and national strategies development of the health sector in developing countries. OneHealth focuses on integrated planning and strengthening health systems. A collection of interactive easy to use web applications which allow the exploration of several health topics can be found on the Policy Tools site. Topic areas include HIV/AIDS, Family Planning and Child/Maternal Health. 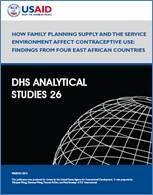 View the data for countries included in the rounds of the Family Planning Effort Index – from 1972 to 2009. Download FPE policy briefs produced by the Track20 Project for a subset of FP2020 countries, comparing current and previous rounds of the FPE. Supporting Family Planning within National Health Insurance schemes.